This set of Concrete Technology Question Bank focuses on “Process of Manufacture of Fresh Concrete”. 2. What is the moisture content in slurry for wet process? Explanation: The moisture content in slurry for wet process is 35-50%. 12% is the moisture content for dry process. 3. The slurry, in its movement down the kiln, encounters a progressively higher temperature. At first, the water is driven off and ___ is liberated. Explanation: At 900°C limestone decomposes, CaCO3.CaO + CO2 (endothermic reaction) CO2 is swept away by current air. 4. Which compound is liberates higher heat? Explanation: C3S having a faster rate of reaction accompanied by greater heat generation develops early strength of the paste. 5. Which compound is liberates lower heat? Explanation: C2S hydrates & hardens slowly so results in less heat generation & develops most of the ultimate strength. 6. Which compound may lead to a rapid stiffening of the paste with a large amount of the heat generation? Explanation: C3A is characteristically fast reacting with water & may lead to a rapid stiffening of the paste with a large amount of the heat generation (Flash-Set)-(Quick-Set). 7. Which chemical compostion has highest content in OPC? Explanation: Lime forms nearly two-third (2/3) of the cement. Therefore sufficient quantity of the lime must be in the raw materials for the manufacturing of cement. Explanation: Sufficient quantity of lime forms di-calcium silicate (C2SiO2) and tri-calcium silicate in the manufacturing of cement. Explanation: Silica gives strength to the cement. Silica in excess causes the cement to set slowly. Explanation: Alumina supports to set quickly to the cement. It also lowers the clinkering temperature. Alumina in excess, reduces the strength of the cement. 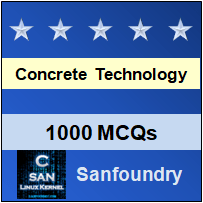 To practice Concrete Technology Question Bank, here is complete set of 1000+ Multiple Choice Questions and Answers.